Thailand's coup leaders to hold ousted government to give them "time to think"
Thailand’s fragile democracy has been repeatedly stunted by 19 actual or attempted coups since 1932. THAILAND’S MILITARY JUNTA says it has disbanded the Senate and placed all law-making authority in the army chief’s hands, dramatically tightening its grip after a coup that has sparked Bangkok protests and drawn international condemnation. The regime also confirmed it had detained former premier Yingluck Shinawatra and scores of other ousted government leaders and would hold them for up to a week as it corralled potential opponents to its takeover. Analysts called today’s developments an ominous sign that the junta led by the army chief, General Prayut Chan-O-Cha, could be digging in for a long-term, pervasive takeover, as it had earlier said the Senate would be retained. Sporadic protests flared in Bangkok for a second straight day, with hundreds of demonstrators defying a ban on political gatherings to denounce the coup, echoing calls from Washington, the EU and elsewhere around the world for the restoration of civilian rule. Prayut seized control Thursday after anti-government forces had waged a several-month campaign, marked by deadly Bangkok street protests, to oust Thailand’s civilian leaders. Civil liberties have been curbed, media restrictions imposed, most of the constitution abrogated, and rival protesters from both sides of the political divide cleared from the capital. Political analysts view the coup as part of a long-running effort by a Bangkok-based power elite, aligned with the monarchy and military, to eliminate the political dominance of Yingluck’s elder brother Thaksin Shinawatra. Thaksin, a billionaire telecoms tycoon, shook up Thai politics by winning devotion among millions of rural poor with populist measures, catapulting him to prime minister in 2001 polls. He was deposed in 2006 in a military coup, fleeing abroad two years later to avoid a corruption conviction but his family and allies have continued his success at the ballot box. The military today said that Prayut had sent a letter regarding his takeover to the country’s revered king, Bhumibol Adulyadej. The monarch, 86, commands great respect among his subjects, and his blessing is traditionally sought to legitimise Thailand’s recurring military takeovers. The army said the king had “acknowledged” Prayut’s letter, but stopped short of describing the response as an endorsement. The palace has yet to issue a statement on the crisis. By taking full control of the executive, legislative and judicial branches, and now the Senate, this shows the military is setting itself up as the sovereign. Briefing the media for the first time since the coup, the military said Yingluck and other prominent figures had been taken in under a martial law provision allowing detentions of up to seven days without charge. It was not known whether any charges were being prepared, but military officials said the detainees were in no danger. “(Yingluck) is under detention, and she is fine,” said Lieutenant General Thirachai Nakwanich, head of the military command for central Thailand including Bangkok. 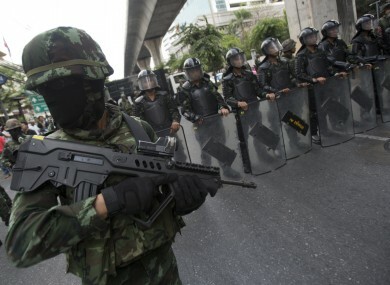 A military official told AFP she was being held at an unspecified army barracks in Bangkok. A night-time curfew imposed by the junta has tamed the capital’s often rowdy tourist districts, further chilling a vital visitor industry already cooled by the long-term strife. Washington, which has led criticism of the coup, took its first concrete steps, suspending $3.5 million in military assistance to its ally, about one-third of its Thai aid. Further cuts were being considered. The constitution was replaced after 2006 with one intended to curb Thaksin’s electoral influence. “This time, the constitutional changes will be more thorough,” Thai politics analyst Paul Chambers said. Anti-Thaksin forces, alleging corruption in Yingluck’s administration, have staged months of deadly Bangkok protests that led to at least 28 deaths and triggered counter-demonstrations by the pro-Thaksin “Red Shirt” movement. Tensions spiralled in early May when a court ruling controversially stripped Yingluck of office, setting the stage for the coup. The “Red Shirts” had earlier warned a coup could trigger civil war but are yet to mount a clear response. However, for the second straight day, demonstrators gathered in at least two locations in central Bangkok to rail against the junta. “I have the right to vote and I want to make it clear that they cannot just steal it from me with a coup,” said a tour guide who identified himself only as Piti. The protesters in Bangkok said they were not Red Shirts. No serious confrontations have yet been reported, but AFP reporters witnessed several people being taken into custody in various locations. Email “Thailand's coup leaders to hold ousted government to give them "time to think"”. Feedback on “Thailand's coup leaders to hold ousted government to give them "time to think"”.